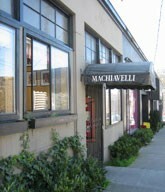 Fancier, higher-concept Italian restaurants come and go in Seattle; old-school Machiavelli, open since 1988, is a reliable friend. The lasagna with spinach noodles and chicken livers is the kind of thing you think about suddenly for no apparent reason—then you must have it that night. People bring their parents or their 10 closest friends or someone they really like for a first (or second, or billionth) date. The tiny bar is especially satisfying in the winter, when passersby look cold and miserable, while inside everyone is insulated with good company, beverages, and anticipation. Machiavelli isn’t fancy, it’s just always good.